No two business aircraft import and exports are exactly alike. That's when decades of experience come in handy while navigating the process. That’s where Dan Moody steps in. Dan Moody, MRA project coordinator, spent four extra days overseas working diligently to complete the U.S. import and inspection of a Swiss aircraft as well as issue a Standard Airworthiness Certificate. Because the aircraft was registered in Switzerland and was required to be de-registered there, Dan had to inspect the Falcon 7X in country, so he flew overseas to Geneva to serve as the customer’s consultant. After the aircraft was de-registered and placed on U.S. Registry, Dan needed to obtain a special flight authorization to get the aircraft within the United States to complete the import process. “I contacted the nearest FAA office in Frankfurt, hoping to simply send the necessary paperwork their way, and they informed me I needed to hire a Designated Airworthiness Representative (DAR) to come inspect the Falcon and approve the authorization,” says Dan. Facing an unknown delay based on the DAR’s availability, Dan approached the customer with two options: wait for the DAR to arrive and hopefully approve the flight authorization or Dan could stay a few extra days and complete the entire import process, negating the need for the authorization. “Experience is the only thing that can prepare you for something like this,” says Dan. Dan was able to complete the import on foreign soil and issue the Standard Airworthiness Certificate during the extra days he was in Switzerland. “The customer was overjoyed. In fact, He asked Duncan Aviation to paint the aircraft at its Battle Creek, Michigan, location,” says Dan. During the last several years, the business aircraft industry has seen increased numbers of new and preowned business aircraft being sold overseas. As a result, aircraft buyers, sellers and service facilities are increasingly involved in cross-border transactions. 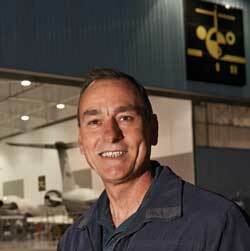 Read more about how Duncan Aviation navigates this complicated process in the 2013 Fall Issue of the Duncan Debrief.